A controversial piece pulled from a Denver, Colorado, student art exhibit earlier this month has incited concerns in the community about free speech violations and sending the wrong message to students when teaching art. The art exhibit, done as part of a Denver public school outreach program, asked students to “select a master work of art, research it and re-contextualize it.” The pieces displayed at the Wellington Webb Building showcased a variety of student works, ranging from depictions of landscapes to a cartoon depicting a Donald Trump-like figure chasing a Speedy Gonzalez-like mouse. 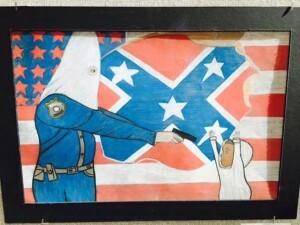 The controversial piece in question, though, showed a KKK hooded police officer pointing a gun at a young African-American child with his hands raised. In the background an American flag is torn open revealing the confederate flag. Inspired by Goya’s The Third of May 1808 and the 2014 piece A Tale of Two Hoodies by Michael D’Antuono, the student’s piece depicts a timely and controversial conversation being discussed across the nation. “I’m greatly concerned about how this painting portrays the police,” said Denver Chief of Police Robert White in a public press release.